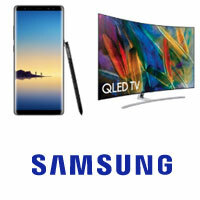 Shop Samsung Electronics at best prices during Black Friday. Samsung offers TV & Video, Mobile, Computing, Cameras & Camcorders, Home Appliances, Accessories and lots more at affordable prices. Now you can buy all Samsung products with ShoppingSpout.us Coupon and Promo Codes.